From Pile Gate (western entrance to Old City and bus stop), walk towards the Hilton Imperial Hotel (located on the north side of the street). Climb the set of stairs behind the bus stop. The stairs are just past the Konzum market and a Russian café-bar. 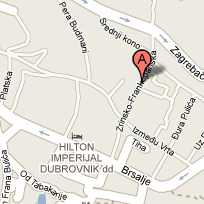 At the top of the stairs, turn right in front of the Hilton sign so the hotel is on your left. Continue on the narrow lane/street up more stairs, to the Hilton's back wall. Cross over the pedestrian street; you are now at the bottom of Zrinsko Frankopanska Street. Climb roughly 100 stairs to #6. Enter through the green metal doors with the Adriatic Kayak Tours sign. The AKT ofﬁce is just past the ﬁrst building- a small terrace with wrought iron furniture with green cushions (and probably lots of kayak gear all over the place). We meet in Gruz harbor, Dubrovnik’s commercial harbor, to board the morning ferry. Gruz is a 25 minute walk from Old City or a 10-15 minute bus ride. We meet at the pedestrian traffic light next to the Jadrolinija and Nona Ana ferry pier; there is a blue and white “Travel Center” sign, a bus stop, and a sidewalk café. Your guide will wear a blue “Adriatic Kayak Tours” T-shirt. Your ferry transfers are included in your tour price. The Dubrovnik to Lopud ferry ride is 50 minutes. The ferry leaves promptly at 10 AM on weekdays, at 9:00 AM Sundays and Holidays. You return on the last ferry of the day, around 7 PM. 9:45 AM Monday-Saturday/ 8:45 AM Sundays and Holidays. Walking directions: From Pile Gate (west gate to Old City and bus stop), walk away from Old City along the main road, past the Hilton Imperial Hotel on your right and a stretch of open sea on your left. Continue straight through the traffic light and continue downhill to an intersection where you’ll turn slightly left (there’s an Ina gas station to the right). You’ll pass an Erste Bank (modern building) on your right and the indoor swimming pool on your left (the road widens to 3 lanes here). You’ll see the top of the harbor at the next major intersection. Continue straight, with the water on your left, past moored tourist boats and private yachts, to the ferry pier and pedestrian traffic light/zebra meeting point. Look for your guide wearing a white “Adriatic Kayak Tours” T-Shirt. From Pile Gate, take bus 1A or 1B, which leave every 10 minutes. A bus ticket is 10 Kuna purchased in a kiosk or 12 Kuna to the driver. Get off at the bus stop at the traffic light next to the ferry pier (past the tourist boats and private yachts). Meeting Location: Gruz harbor at the traffic light near the ferry pier.